136 pages, 8 1/2 x 11 spiral bound format. Ashtar and Sananda Planetary Updates: Volume Three is a continuation of Volumes One and Two. 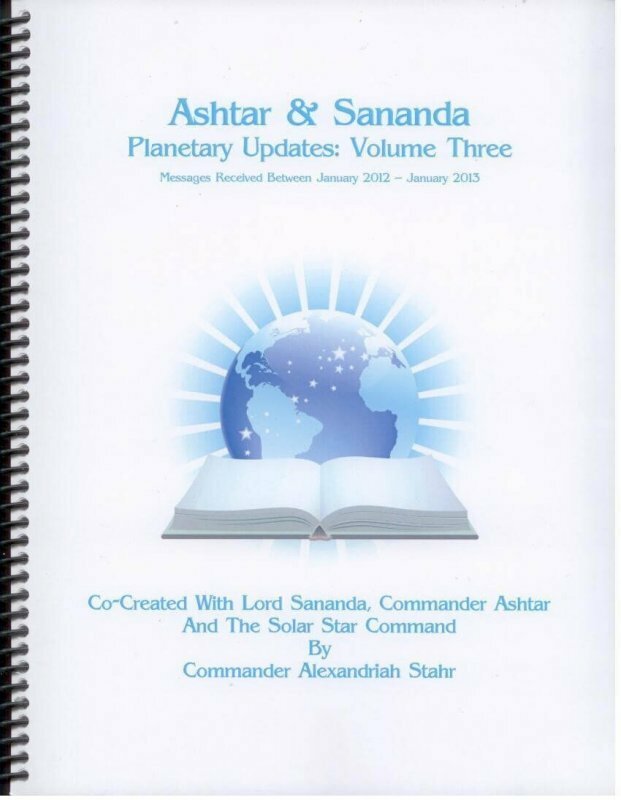 These books are compiled messages from Commander Ashtar and Lord Sananda on the status of the Planetary Ascension channeled through Commander Alexandriah Stahr. These are updated messages in the moment with what Commander Ashtar and the Ashtar Command - Solar Star Command is doing to transition the Planet through the 2012 Portal to the 13.13.13 Solar New Earth Reality Timeline. These timely messages explain what is going on and the issues that you may be aware of and are dealing with as we journey through the dismantling of the MATRIX and the re-establishing of the Christ Vibration Reality on the Earth. Volume 3 focuses on the true meaning of 2012. Most people think 2012 has come and gone. Nothing could be further from the truth. 2012 was simply an important milestone in the Planetary Ascension Process which continues through till 2045 when all souls will finally be FREE from The MATRIX. Order the book now and see the various Freedom Series that were released during the calendar 2012 in preparation for going through the 2012 Portal. This portal still exists as a state of consciousness that all must pass through in order to Return to the Christ Vibration. The Freedom Series described in the book can be requested anytime during a phone session with Alexandriah.